As I near the end of the Wainwrights in Colour project I work away in the studio by mostly completing the last of the sketches of the fells during the day and then, late into the evening fine tuning the book. After the set back of January it is now full steam ahead to get the whole project completed and it is exciting but nervous times, self publishing such a volume does come with pressures but also with some freedom. Those who have been following the project may have noticed that there is no sponsorship from big companies behind me, no gaudy logos or adverts cluttering up the scene. It’s not that I didn’t get any, the fact is that I didn’t ask for any. As Wainwright did, it is just one man working on his own and that’s the way I like it. 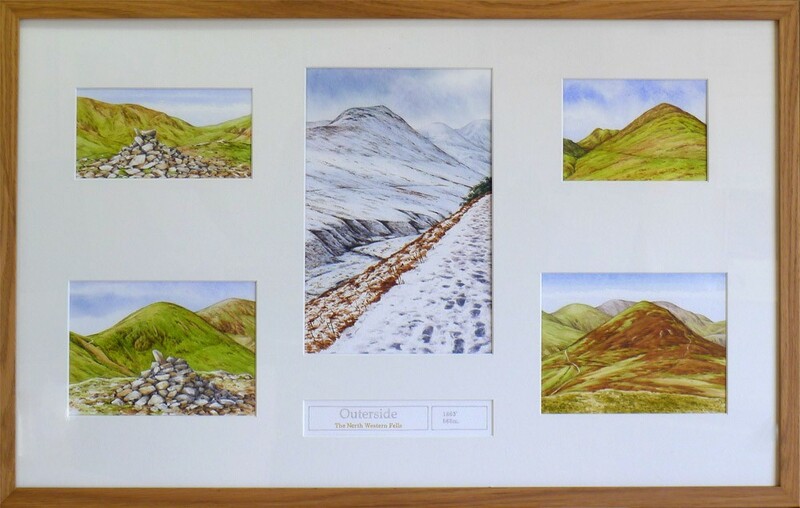 One of the fells which has been half completed in my studio for some time is Outerside, a fell which sits in the heart of Coledale near Braithwaite. 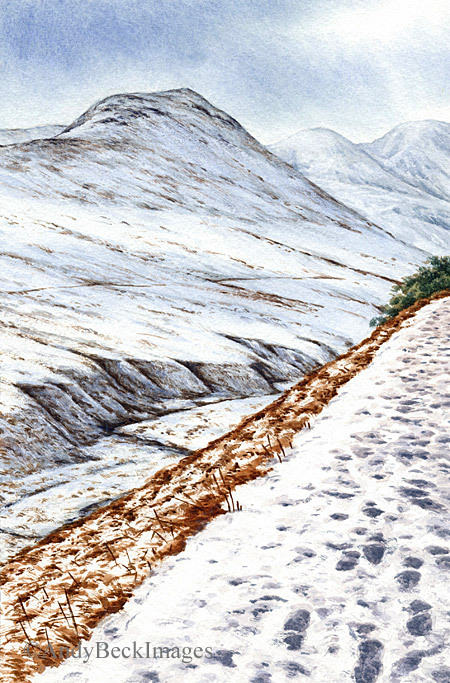 The work consists of only 5 sketches but there was one reference that I was not happy with and that is the main view “Outerside from Coledale” which in the Pictorial Guide Wainwright depicted in full winter conditions. Throughout the whole project I not only have obtained the reference photographs from exactly where AW stood but wherever possible doing so in the same seasonal conditions. 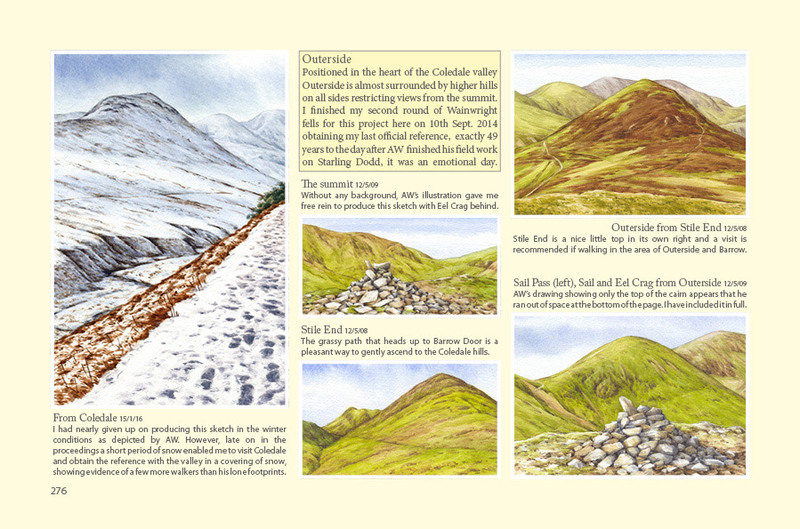 The illustration in the guide is one of the very few which has snow across the whole landscape but seeing the scene in such conditions had eluded me. Yes, I already had a reference from the right place but in late autumn so not the same look or feel at all to what I needed. The trouble is that usually when the snow line is that far down in the Lake District it is often the case that my route to the fells, the A66, is blocked and restricts my access to the west, that’s the drawback of living at 1000′ up in the North Pennines. 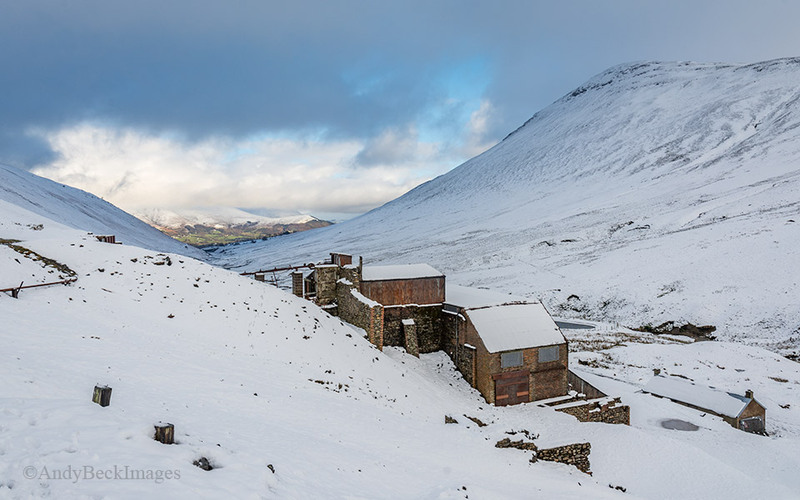 However, a few weeks ago in mid January the conditions looked just about perfect, I had seen on social media a photo posted by a friend a view of the north-western fells under a decent covering of snow that very morning. So this was too good an opportunity to miss and within an hour and a half I was parked up near Braithwaite ready to tick off this one winter reference. The conditions were not perfect as there was low cloud hanging over the high fells and the light was on the dull side but none the less the snow was there, just enough for my needs. There were other walkers out and about, probably heading for the summits but my task for today was solely to obtain my reference. Besides, I had a lot on my mind during these weeks and actually my spirit was low so a short, easy walk was really all I could manage at this time, my heart wasn’t up for bigger adventures. Bailey certainly enjoyed the run out and we ended up here, at Force Crag Mine where I stopped for a drink, something to eat and to catch the improving light with the camera. 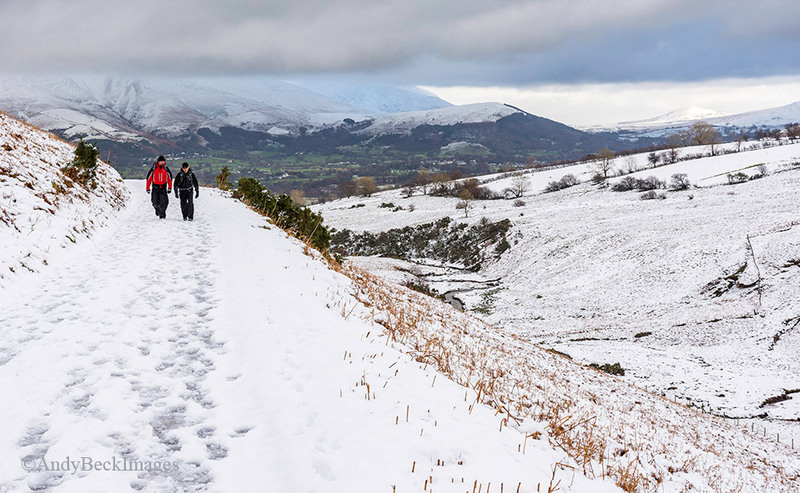 Coledale is ideal for a walk such as this, easy and on level tracks with plenty of interest surrounded by high fells. Outerside, seen here on the right, was now free from cloud so by re-tracing the route back towards Braithwaite it was ideal for me to capture the reference that I needed and at last I could get back to the studio to complete the fell. As with all the fells for the project, the framing has been done by me with the aim of producing a final work that is balanced within the frame. In this instance the winter scene in the middle is neatly surrounded by sketches from other days. Altogether a work that I am more than pleased with. So this is how the page for Outerside in the book will appear. Due to the constraints of the page size, fitting in the sketches with relevant text is quite a challenge especially as wherever possible I try to place them in the order that they feature in the guide book. That then is the story of how I came to complete the work for just one of the 214 fells for the Wainwrights in Colour project. A bit of luck enabled me to portray the winter scene that had been preying in my mind for some time and hopefully shows just some of the background work which has gone on behind the scenes.